The “Master Draught” in Rothenburg ob der Tauber – that means living history and colorful events in front of the unique backdrop of this wonderfully preserved, medieval town in the romantic Franconia. the dramatic and legendary events of the year 1631 were performed every year since 1881. Pageants, camp life, market activity and numerous events during these days have enchanted guests from near and far for more than a century. The noticeable joy of the Rothenburgers at their party, which they are attentive to with great dedication and attention to detail, but also know how to celebrate, gives this historic festival a very special family atmosphere. The war has been raging in the country for thirteen long years. In the autumn of 1631, the Catholic Generalissimo Johann T’Serclaes Imperial Count von Tilly with 60,000 men penetrates to the walls of the Protestant imperial city of Rothenburg ob der Tauber. On October 31, the resistance is broken, the city stormed and mayors and all councillors sentenced to death. A magnificent tankard, an unusual trade and an incredible deed bring the happy turn. Since 1881, the stage play, The master Draught’ played by citizens of Rothenburg in the town`s imperial hall is performed annually. Since 2016 it belongs to the “Cultural heritage” of UNESCO at the federal level. In a triumphant parade, over 800 festival players, accompanied by many horses and wagons, wander through the historic streets of the old town. Led by the marching band, the actors of the playgroup of the “Master Draught” march, followed by Young Troopers, Camp Women, Mercenaries and much more with a large contingent of guns, powder cars and rolling provisions out to the camp. Once there, the Imperial, Swedish and Rothenburgers celebrate happily together, with plenty of hearty food, a good drink and of course a lot of music, saving the city from looting and pillaging. 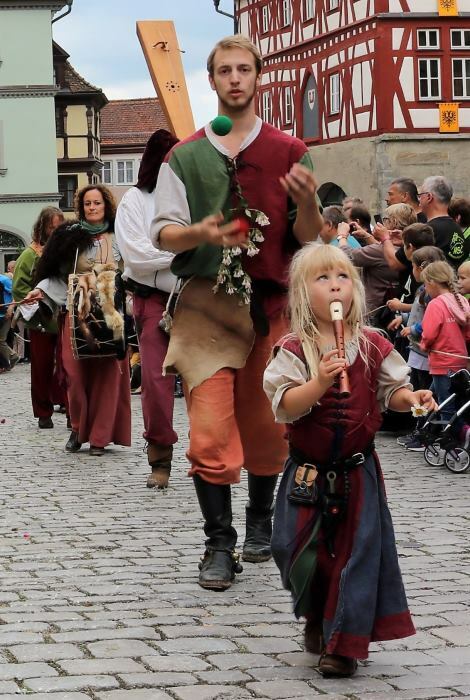 On the historical handicraft market, to be found on the Green Market and the church square in front of the town church of St. Jakob, there is a colorful and entertaining market on all four days of the Pentecost weekend. Craftsmen, chandlers and traders from all over the world find each other and offer their goods for sale. Musicians, jugglers and storytellers entertain the young and young at heart. The bartenders will be delighted to serve medieval and other culinary delights for the well-being of guests from near and far. For the Whitsun finale, the actors of the playgroups, Rothenburgers and their guests will celebrate a public festival in the camp to say goodbye to General Tilly at the market square at the end of the Pentecost weekend.